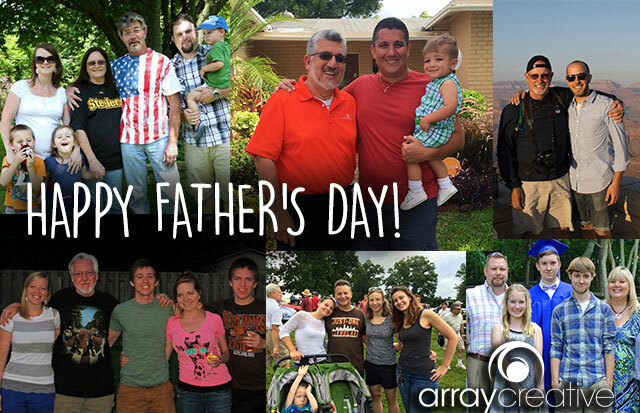 Happy Father’s Day from Array! When you think of Father’s Day, who or what comes to mind? Father’s Day is so much more than a designated day of the year to celebrate the fatherly figures in our lives, it’s a time to show those men our appreciation for all they do, even if it is often overlooked or forgotten. As I grow older, holidays like this become more and more sentimental and meaningful, especially since my, and many other people’s parents, are thousands of miles away. With that being said, I always become frantic in the weeks before Father’s Day trying to come up with the perfect gift. If any of your dads, husbands, brothers, friends, or so on, are anything like mine, you must have the same thoughts going through your minds as I do. What the heck do you get/do for a man that deserves everything… with a small college budget or without being close enough to celebrate in person? Since I know that I am not alone in this conquest, I took the initiative to ask the rest of the team here at Array Creative a few questions about Father’s Day, and what they plan on doing for all the important dads in their lives. What do you plan on doing for Father’s Day? What would be your ideal Father’s Day/Father’s Day Gift? What do you plan on getting for your dad, husband, etc.? Cathy: “For my husband, his gift is fishing themed. I bought a pole for our daughter so they can go together, gummy Swedish Fish (his favorite) and a personalized lure that says ‘Hugs and Fishes’. Viki: “My dad is so hard to shop for because he’s really picky. He likes gag gifts a lot though. One year I bought him a captain’s hat that he wears all the time now (pictured above), so I plan on buying him a customized one this year. Hopefully we were able to help you get some ideas for potential Father’s Day gifts, if not, here’s a link to a cool site where you’ll be sure to find something! If you have any other good Father’s Day ideas or want to share your own plans please feel free to comment below and share! We here at Array Creative wish you and your families an amazing Father’s Day!